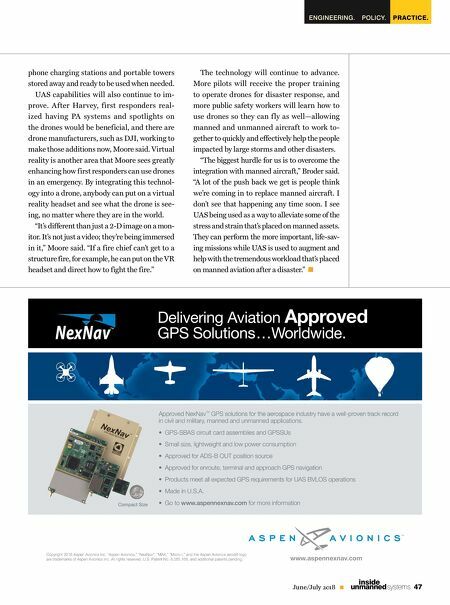 AIR EMERGENCY RESPONSE 46 June/July 2018 unmanned systems inside have to have a plan for that. It's a challenge a lot of folks are working on. There are different solu- tions but none of them are perfect." Working more closely with the experts the data is being collected for will help, Robinson said. If experts travel with drone operators and are there during the missions, they can look at the images as they're coming in and tell right away which ones are useful and which ones are not. If necessary, they can even commu- nicate what they're seeing to the command center via radio. Traveling with local reps also can help save valuable time. Broder and his team traveled with water man- agement district employees during Harvey. The employees could suggest alternate routes when main roads were unpassable and knew how to get into neighborhoods that might be f looded. They also had access to restricted areas, enabling the UAS team to capture data they needed from the best locations. THE IMPORTANCE OF PRE-POSITIONING Just like with any first responders, properly trained drone operators need to be able to de- ploy as soon as possible after a storm hits. The quicker they can respond, the quicker they can remediate, which is why pre-positioning is so critical, Robinson said. Southern Company f lew drones during Harvey, Irma and Maria, the storm that devas- tated Puerto Rico, to help restore power faster. During Harvey, they received a mutual assis- tance request to f ly drones for CenterPoint Energy. Corey Hitchcock, UAS standardiza- tion pilot for Southern Company, agrees that pre-positioning with assets ready to go before landfall is key to an effective response. Hitchcock and the Southern Company teams used drones for a variety of applications, including transmission inspection, right of way inspection and situational awareness, helping crew members know exactly what repairs were needed and allowing them to more easily navi- gate to the location of the repair. "When we stand up a storm team we auto- matically include a drone asset like we would include a bucket truck or a mechanic," he said. "We're also trying to identify personnel inside the company who don't normally have storm jobs and train them how to use UAS so we can mobilize them during a storm. That way we don't have to tie up engineers or linemen." THE FUTURE Drones will continue to be deployed to aid in disaster response, and will have the ability to perform missions we can't even imagine to- day, Moore said. 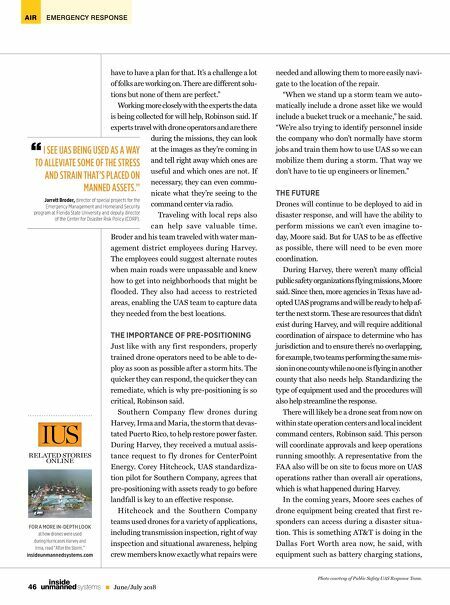 But for UAS to be as effective as possible, there will need to be even more coordination. During Harvey, there weren't many official public safety organizations flying missions, Moore said. Since then, more agencies in Texas have ad- opted UAS programs and will be ready to help af- ter the next storm. These are resources that didn't exist during Harvey, and will require additional coordination of airspace to determine who has jurisdiction and to ensure there's no overlapping, for example, two teams performing the same mis- sion in one county while no one is flying in another county that also needs help. Standardizing the type of equipment used and the procedures will also help streamline the response. There will likely be a drone seat from now on within state operation centers and local incident command centers, Robinson said. This person will coordinate approvals and keep operations running smoothly. A representative from the FAA also will be on site to focus more on UAS operations rather than overall air operations, which is what happened during Harvey. In the coming years, Moore sees caches of drone equipment being created that first re- sponders can access during a disaster situa- tion. This is something AT&T is doing in the Dallas Fort Worth area now, he said, with equipment such as battery charging stations, FOR A MORE IN-DEPTH LOOK at how drones were used during Hurricanes Harvey and Irma, read "After the Storm," insideunmannedsystems.com RELATED STORIES ONLINE Photo courtesy of Public Safety UAS Response Team. I SEE UAS BEING USED AS A WAY TO ALLEVIATE SOME OF THE STRESS AND STRAIN THAT'S PLACED ON MANNED ASSETS." Jarrett Broder, director of special projects for the Emergency Management and Homeland Security program at Florida State University and deputy director of the Center for Disaster Risk Policy (CDRP). "